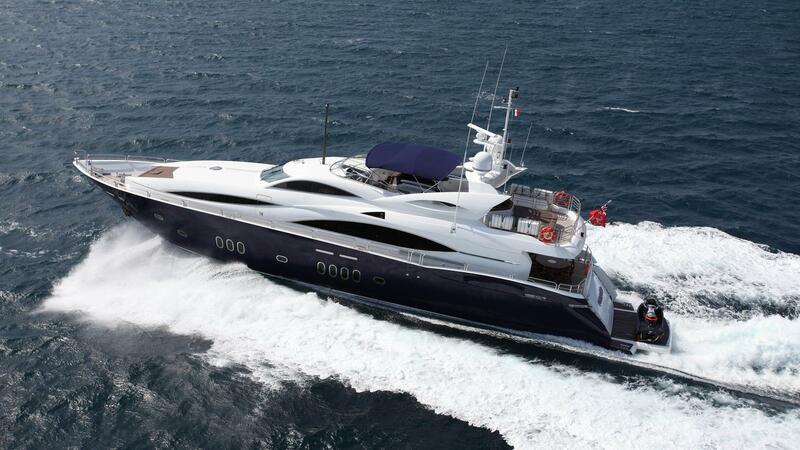 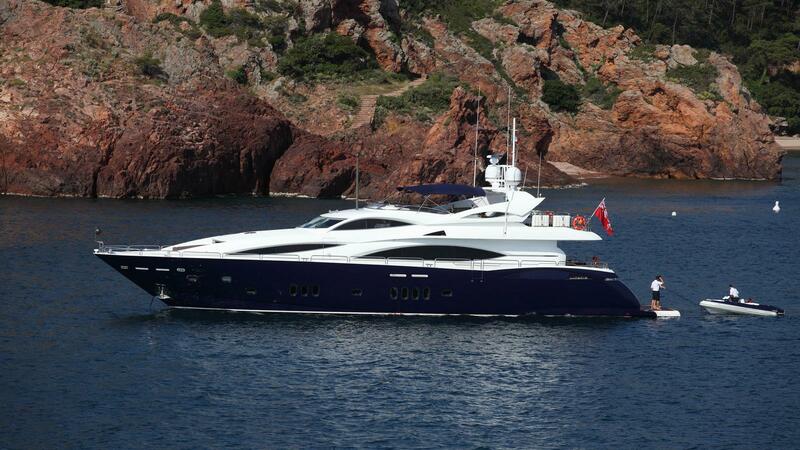 KEFI is a Sunseeker 105 yacht measuring 32 meters (105 Feet) in length, built by Sunseeker Yachts in 2004. 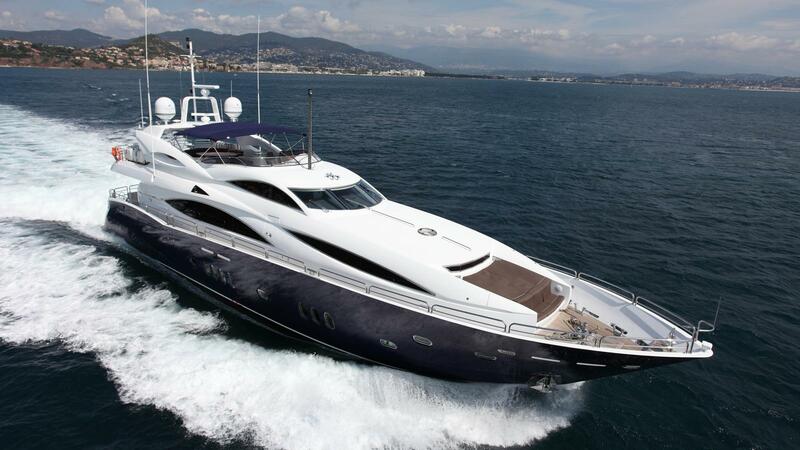 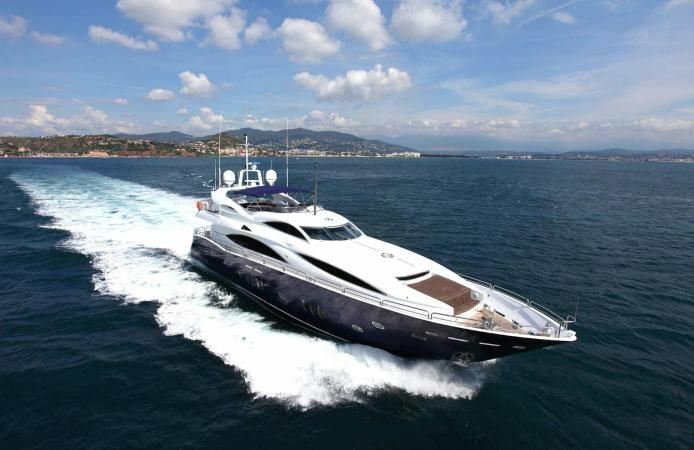 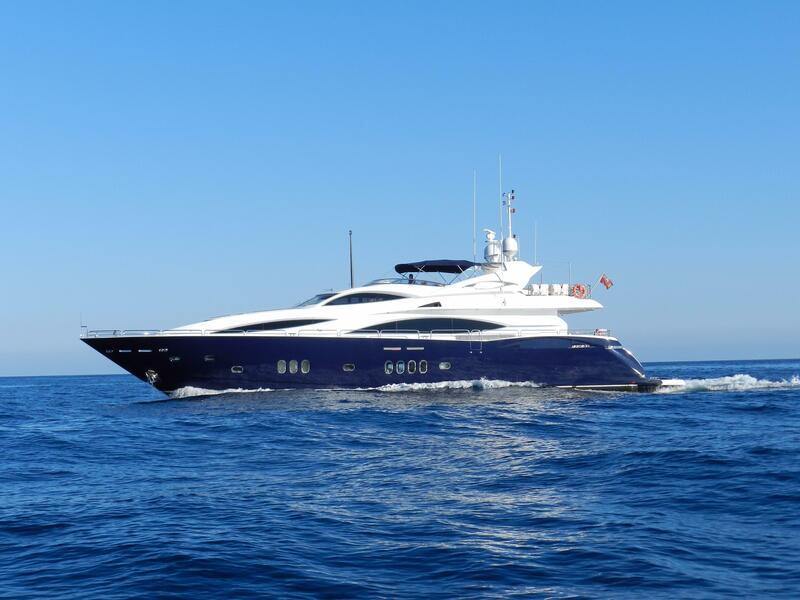 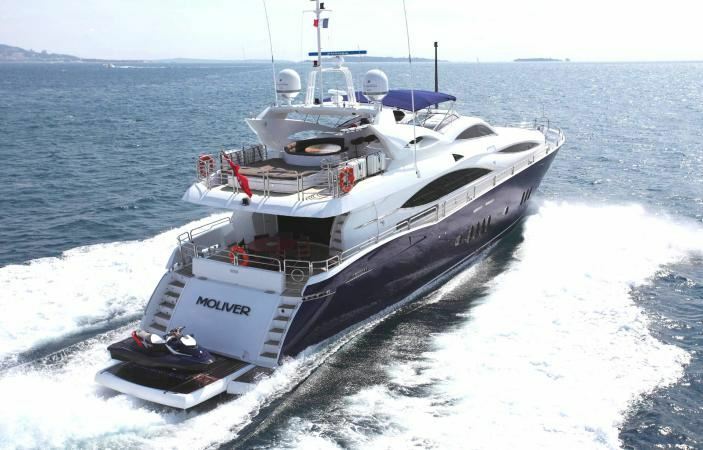 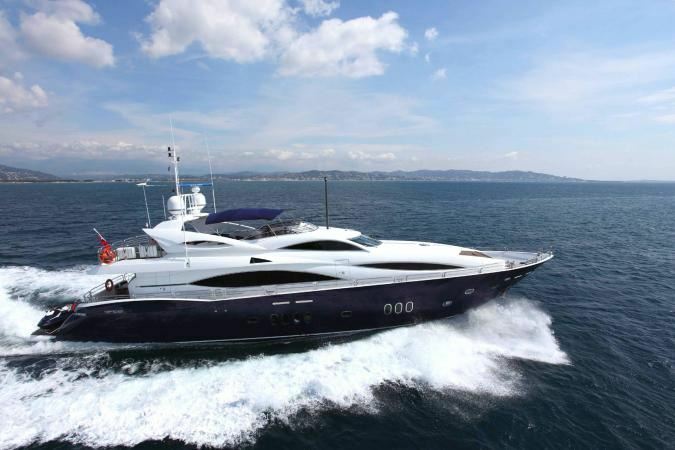 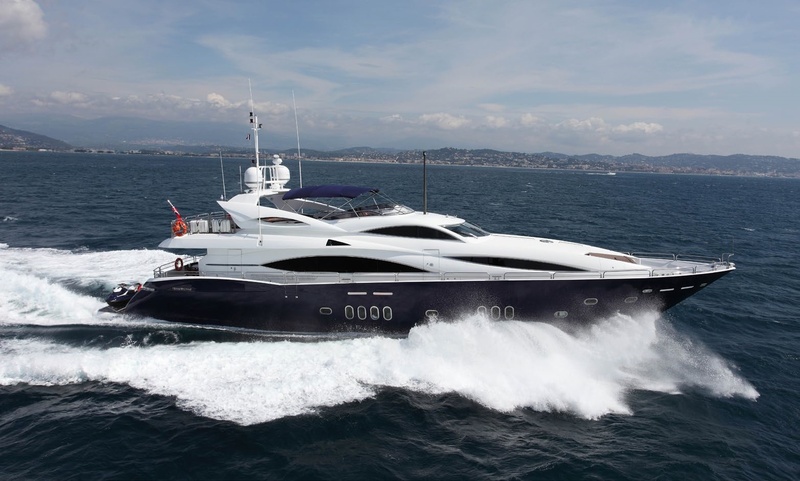 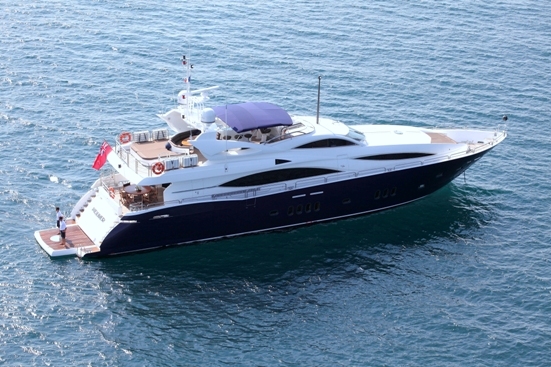 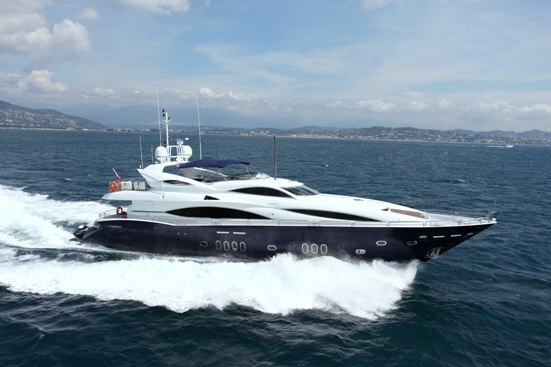 She was the only Sunseeker 105 Yacht to be built to and achieve the MCA large yacht code within this award winning line. 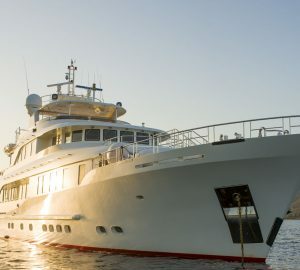 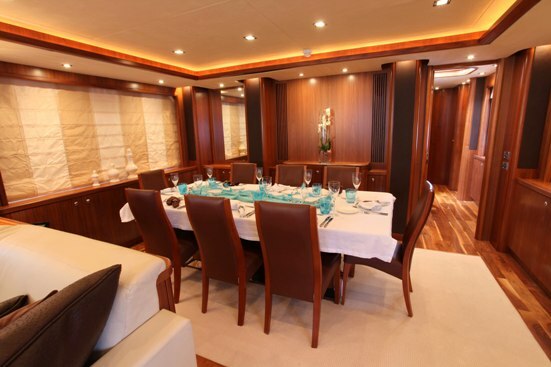 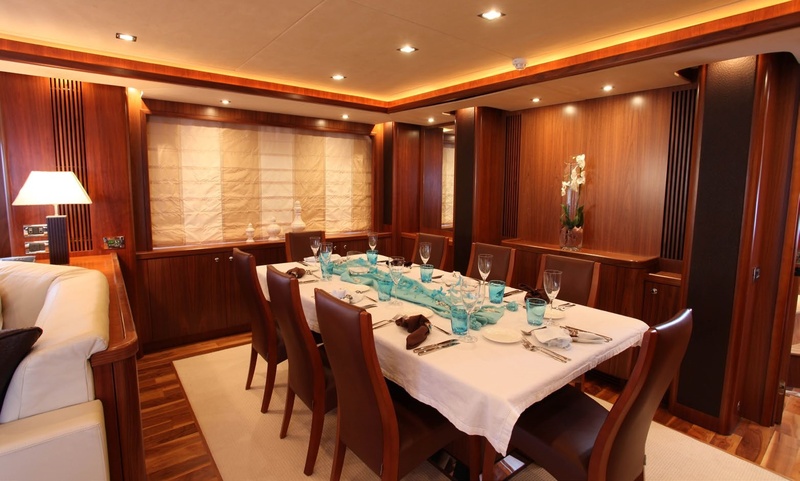 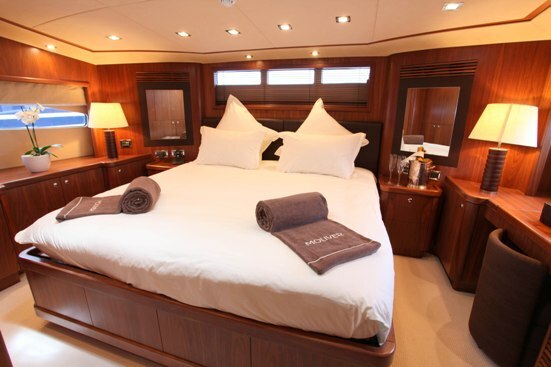 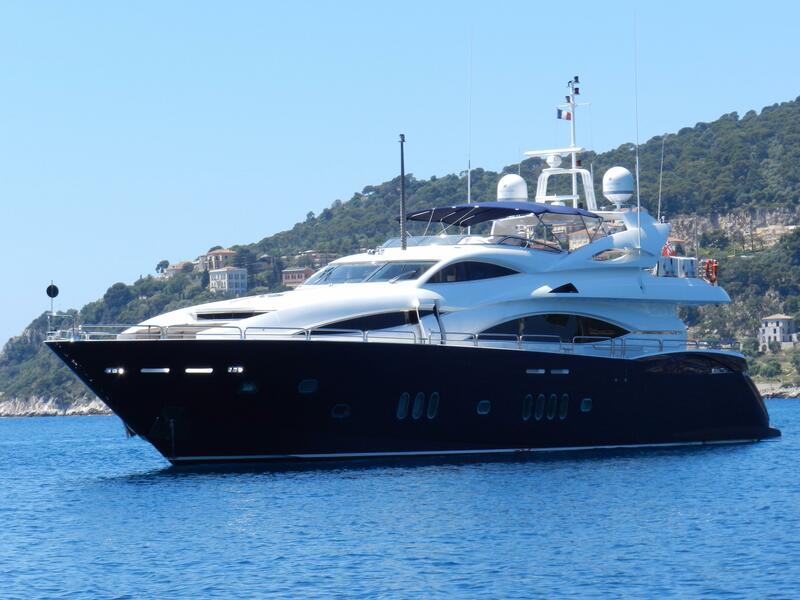 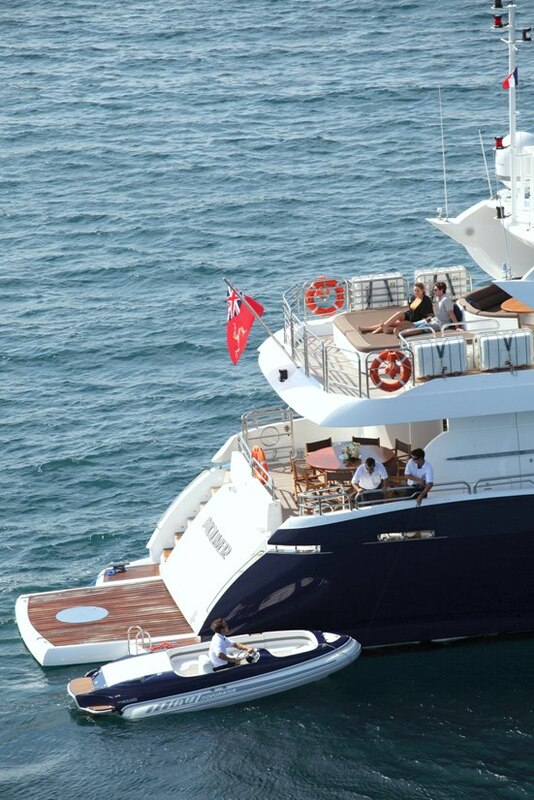 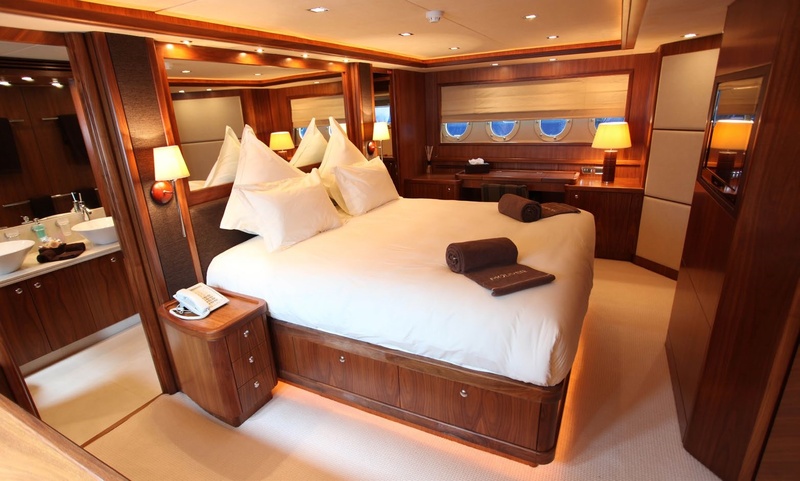 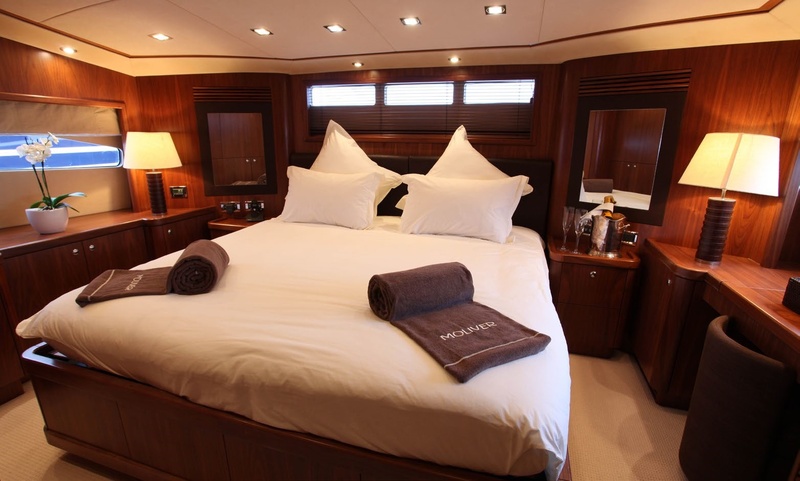 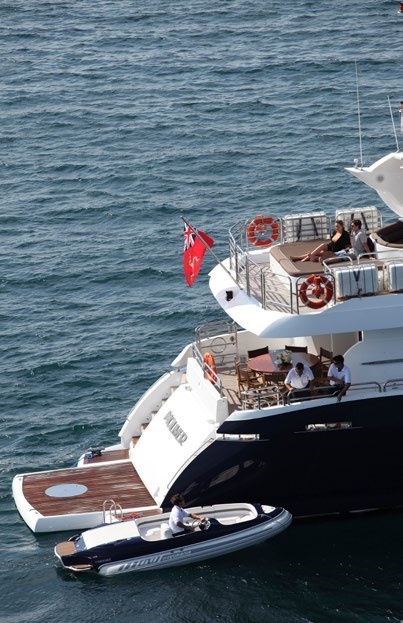 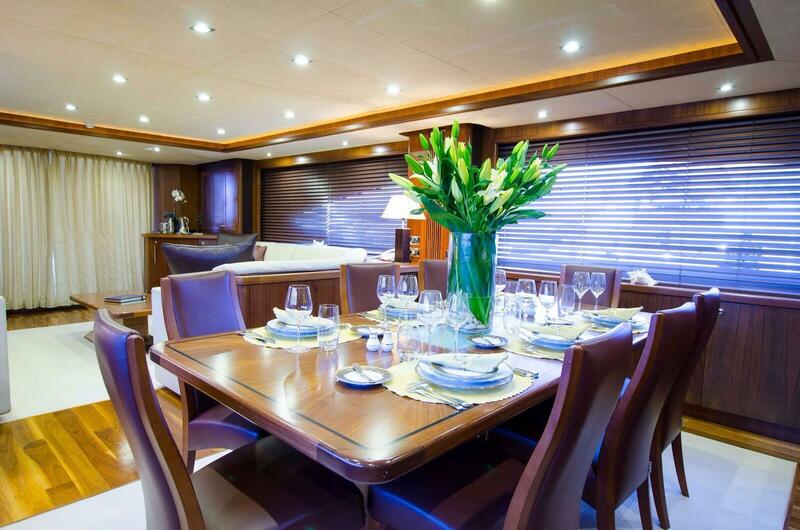 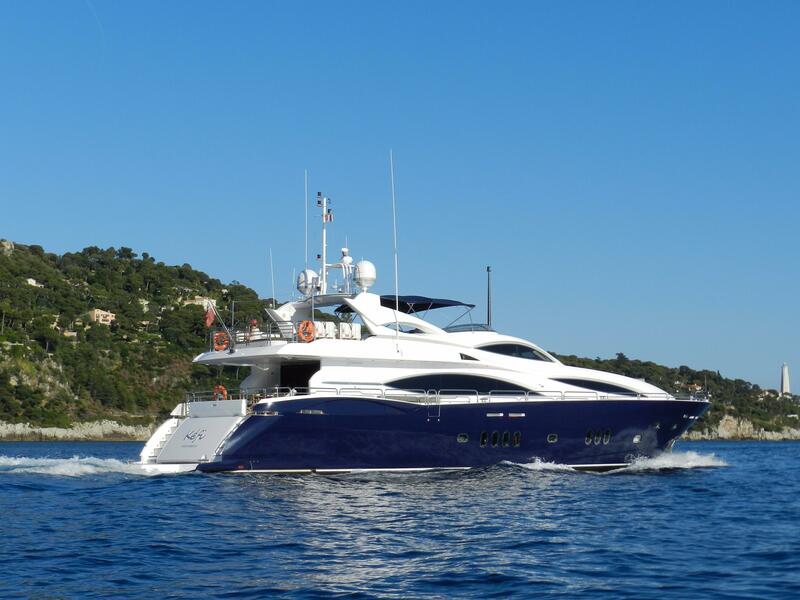 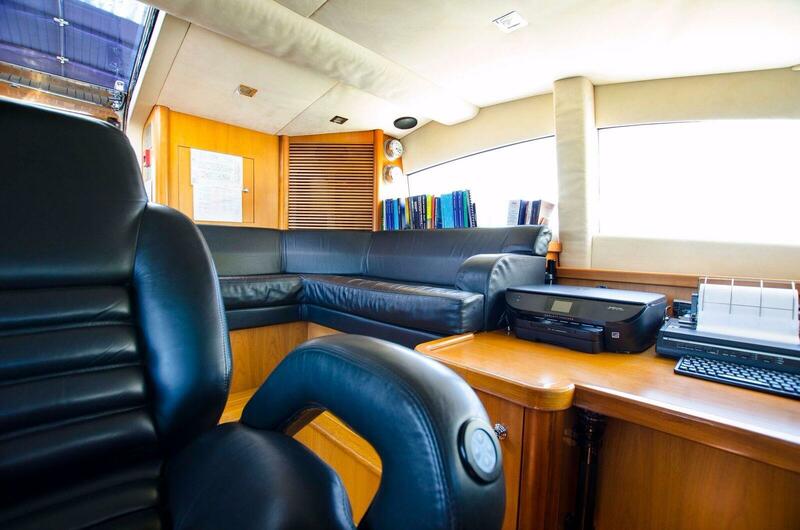 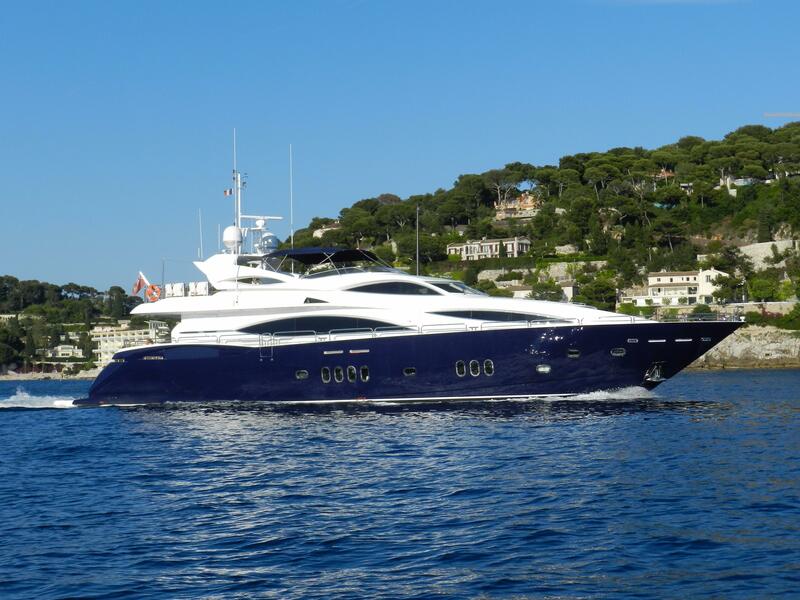 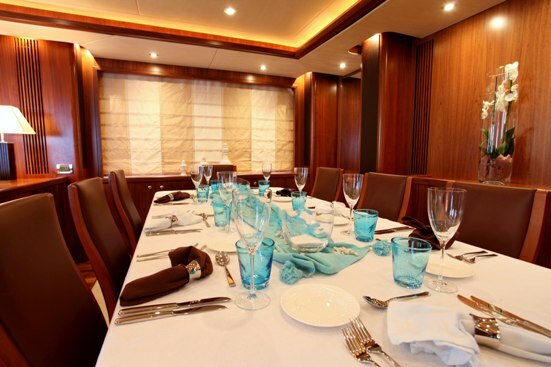 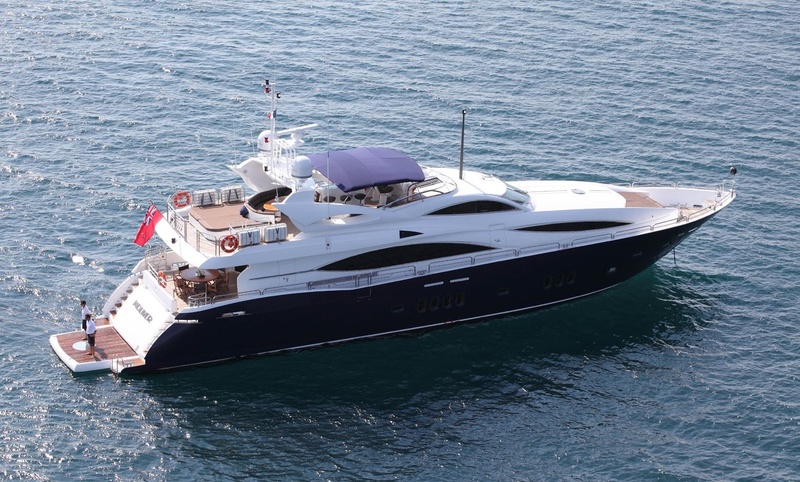 She is able to accommodate up to 8 charter guests in 4 well appointed cabins. 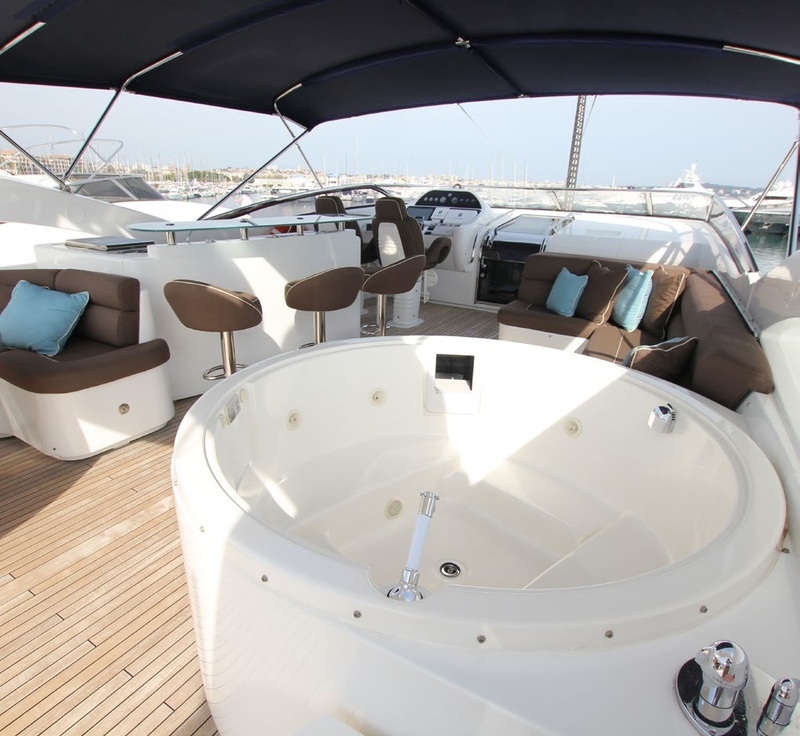 KEFI'S NOTABLE FEATURES: Fast and sleek ~ Impressive space throughout ~ Great range of water toys ~ High speed stabilizers underway. 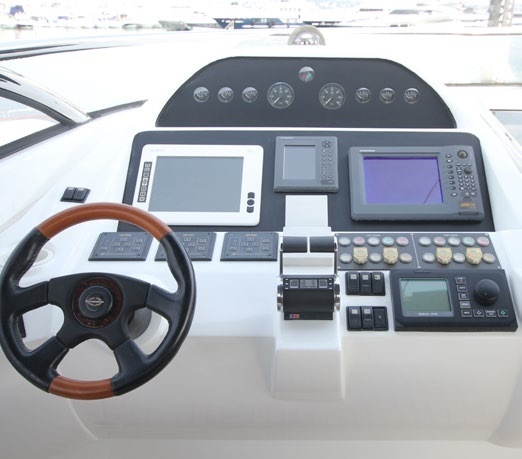 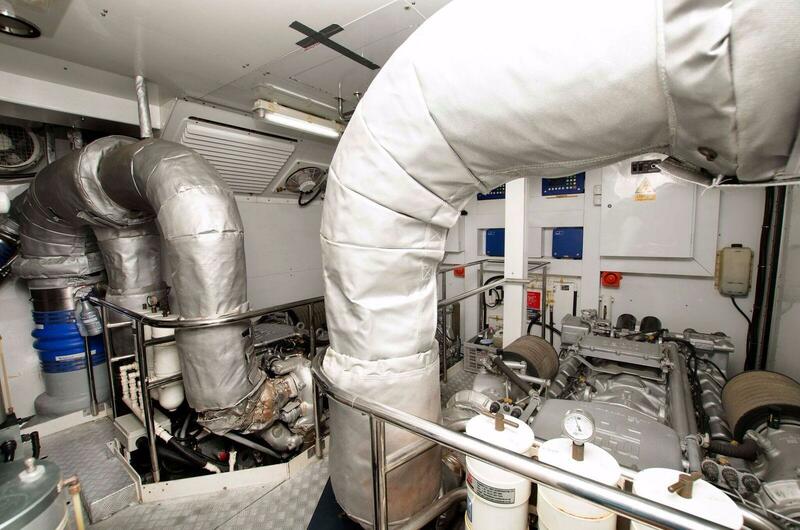 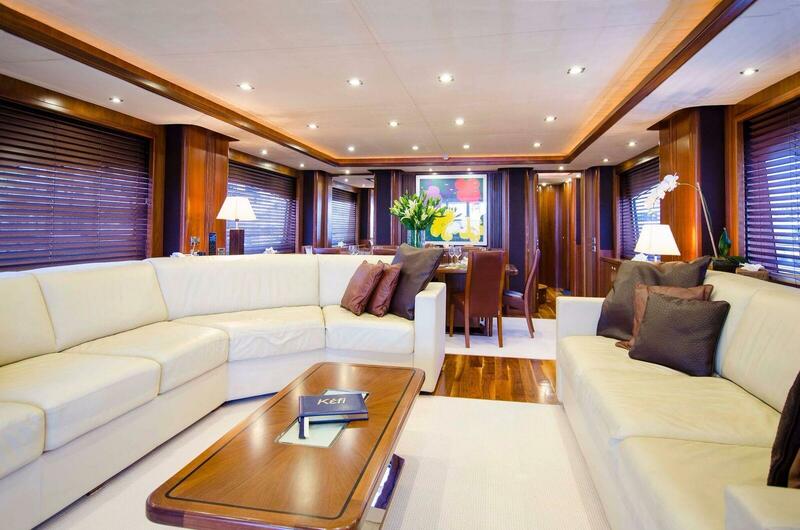 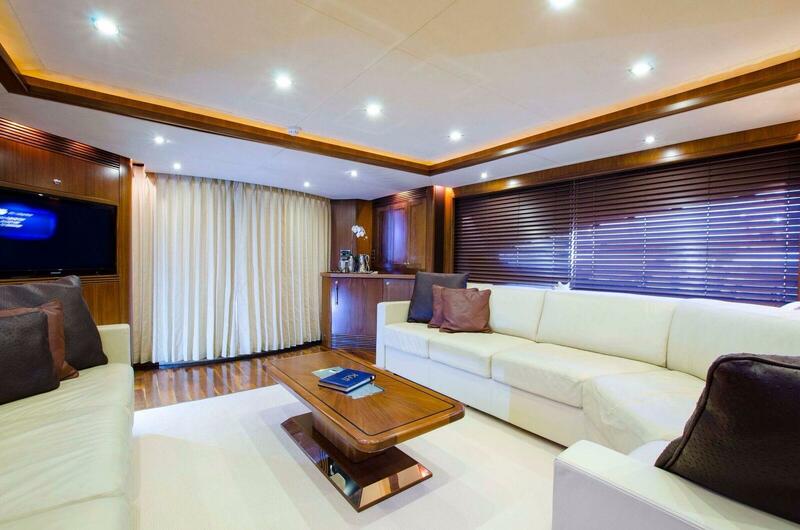 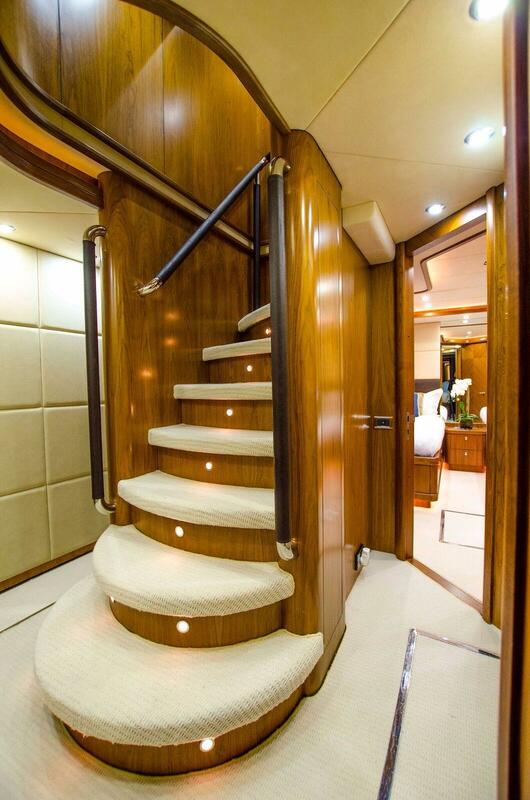 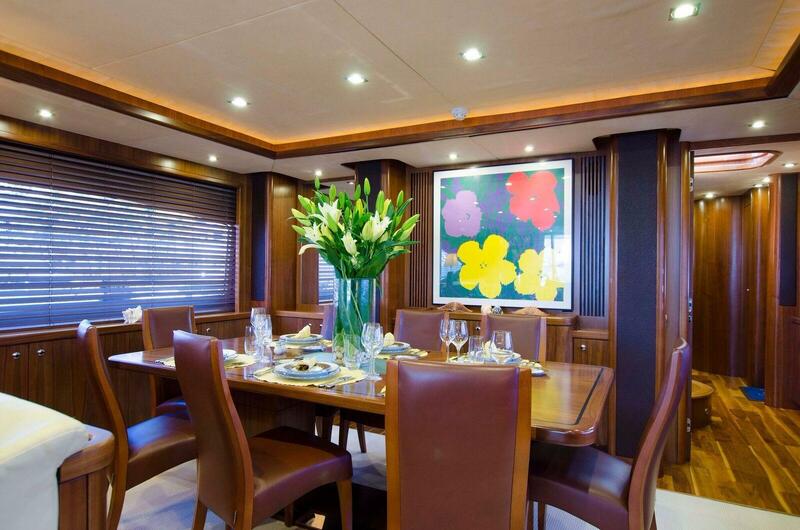 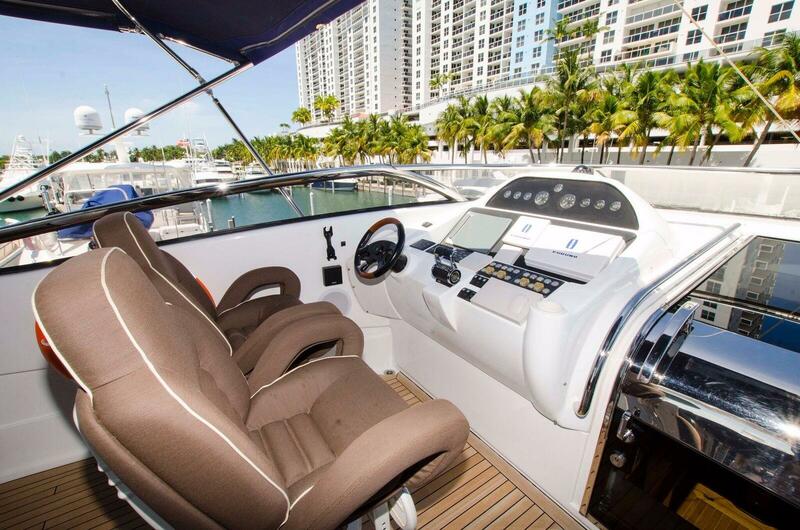 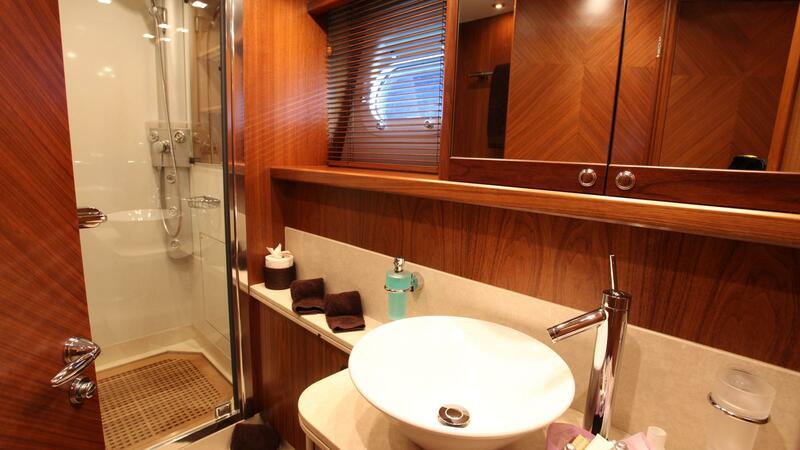 The yacht has been fitted to a very high standard throughout. 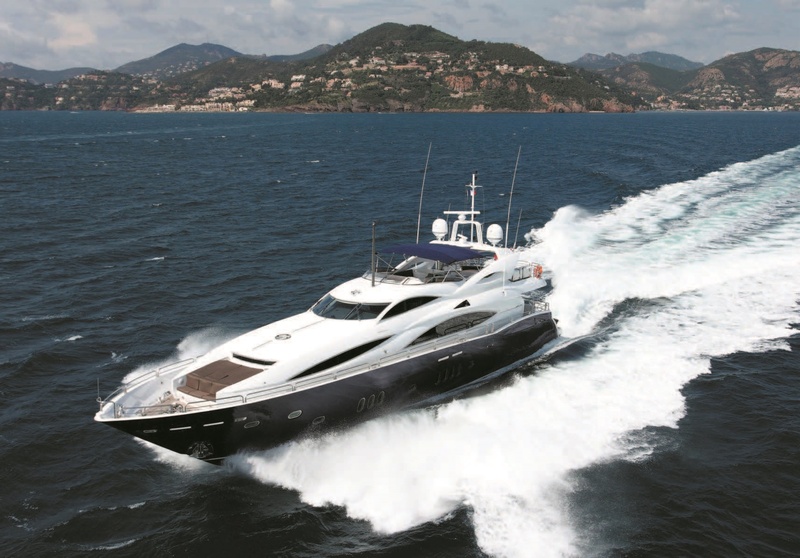 Her streamlined design is sleek and sporty and she effortlessly combines style and sophistication with power and performance. 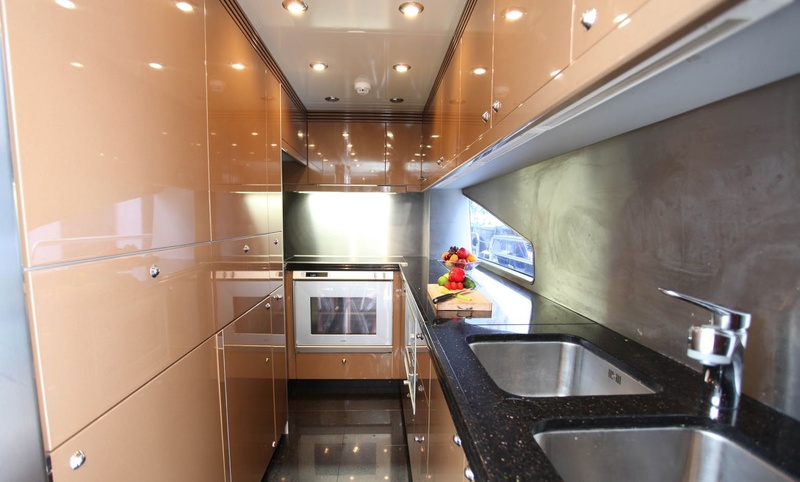 KEFI has a sophisticated and elegant décor, designed by Ken Freivokh, and finished in tones of cream and chocolate. 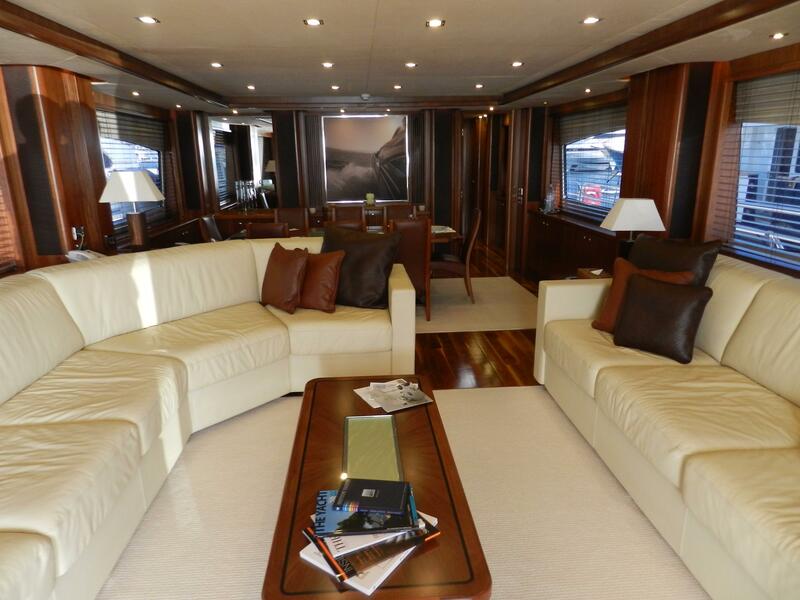 Her interior features a spacious and open layout that provides warm and welcoming spaces for friends and family to gather. 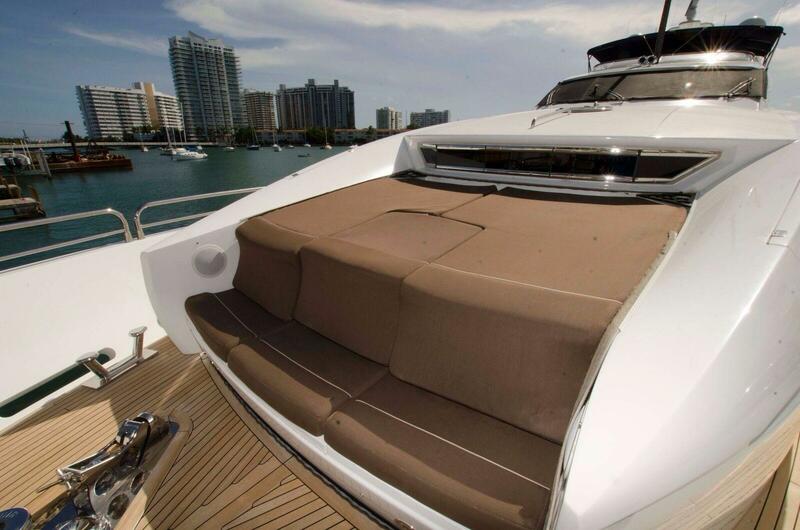 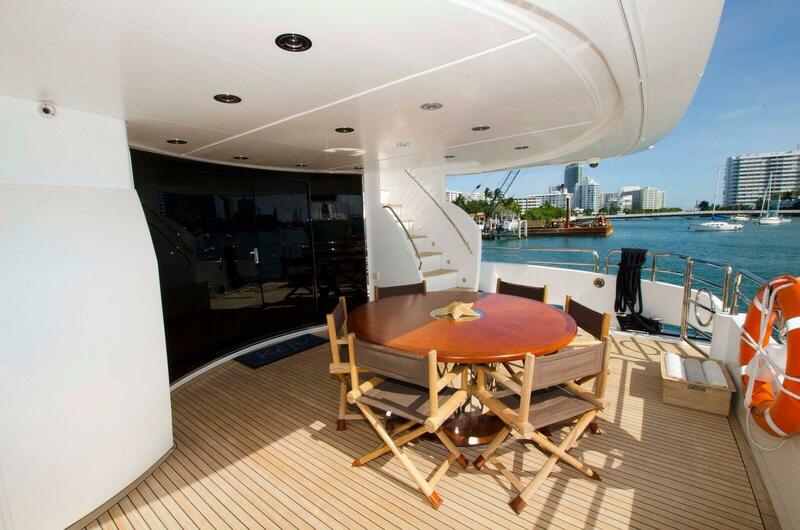 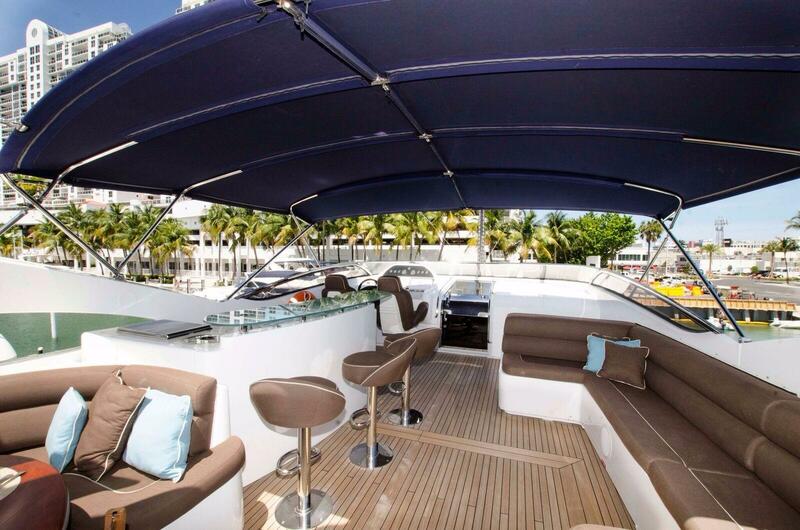 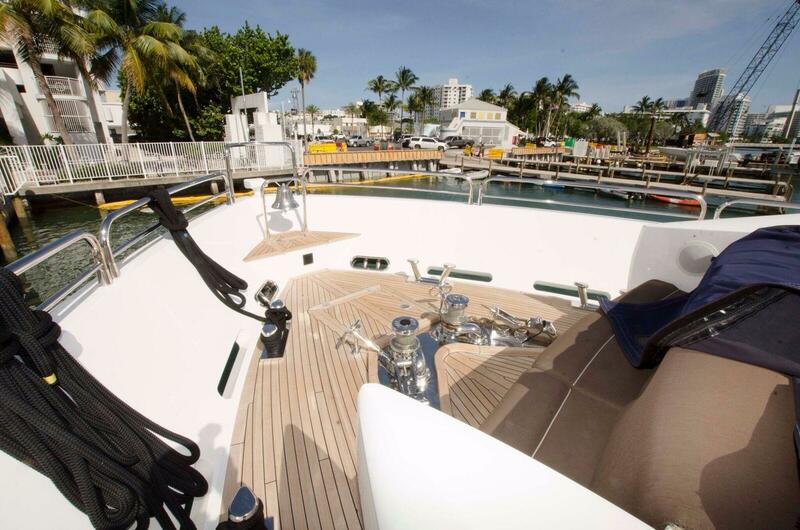 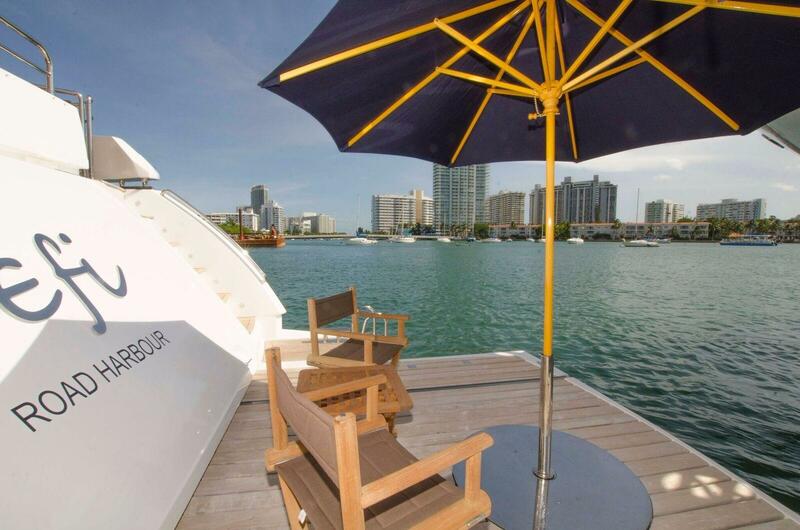 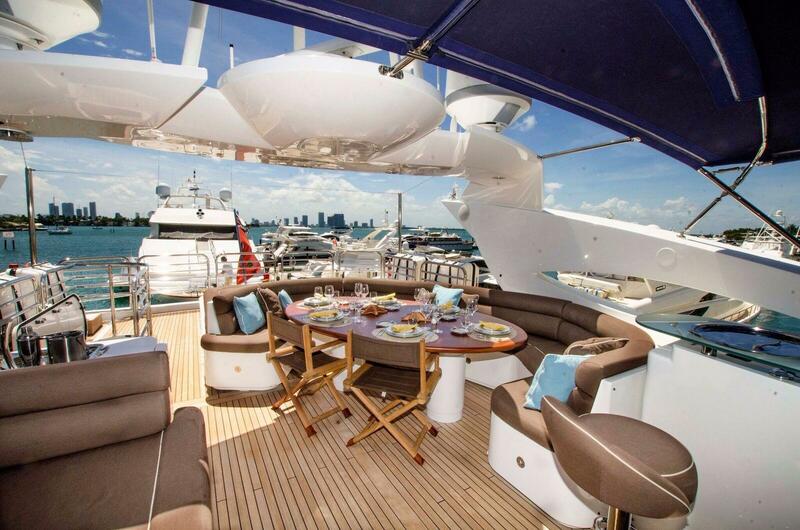 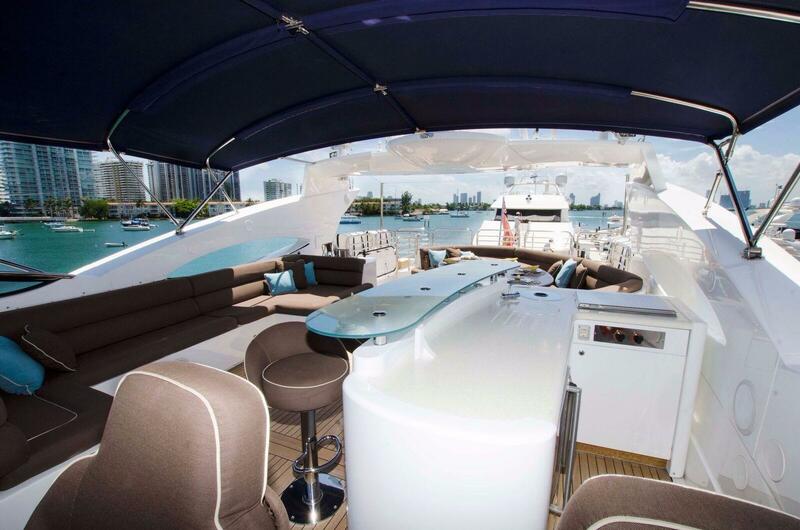 Her exterior deck spaces are equally as impressive, offering a variety of options for relaxing in the sun or shade. 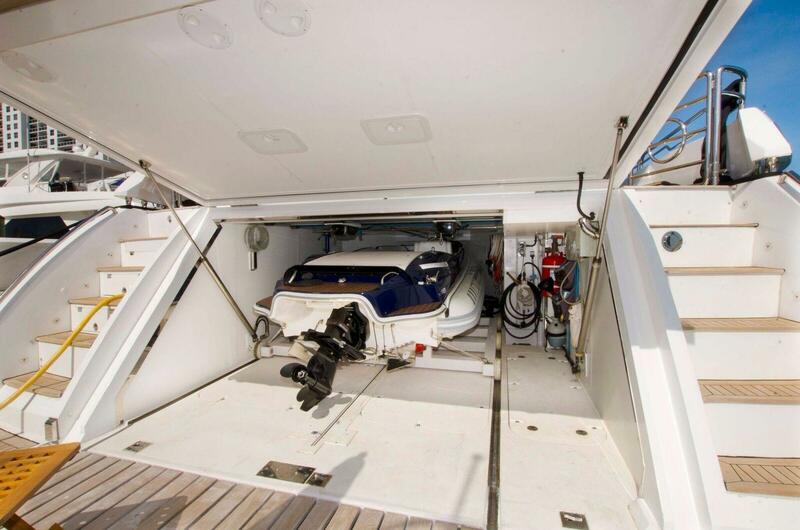 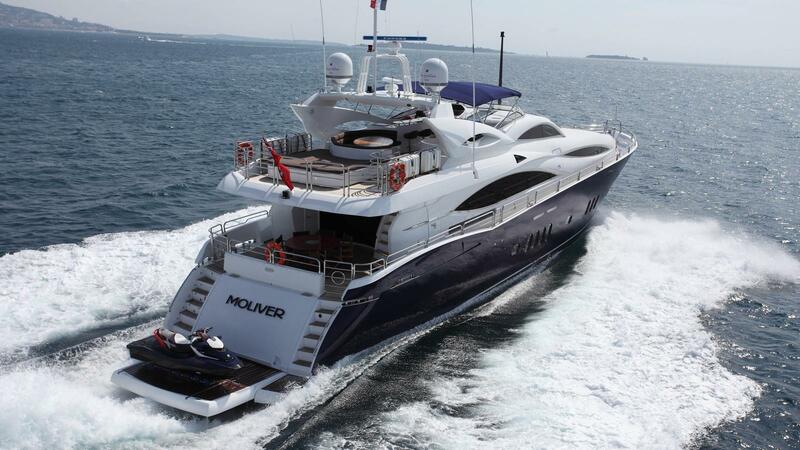 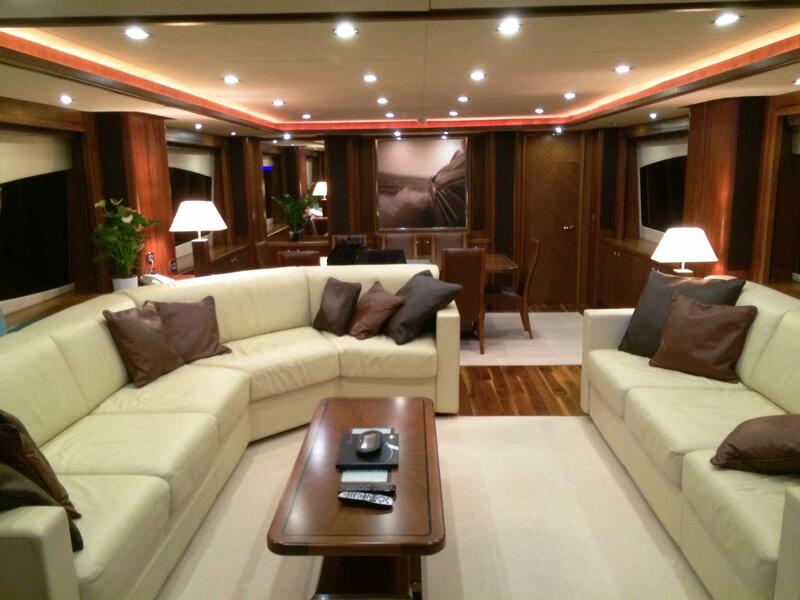 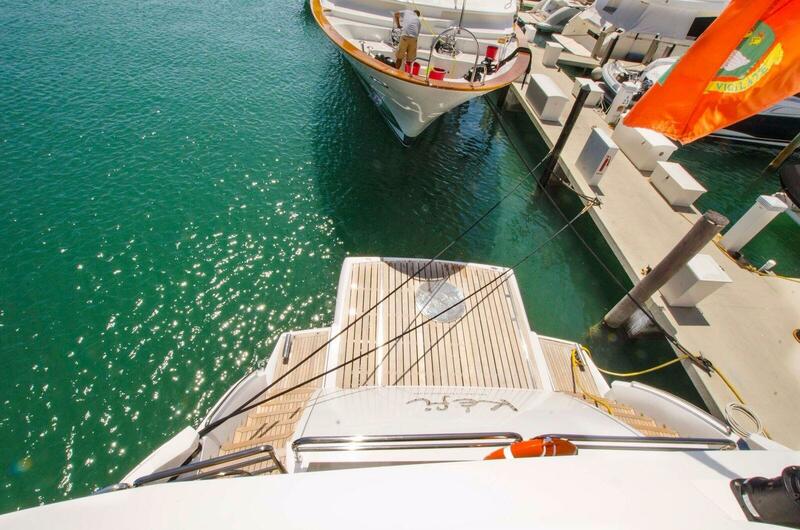 In the garage, she is equipped with an extensive array of water toys for charter guests’ entertainment. 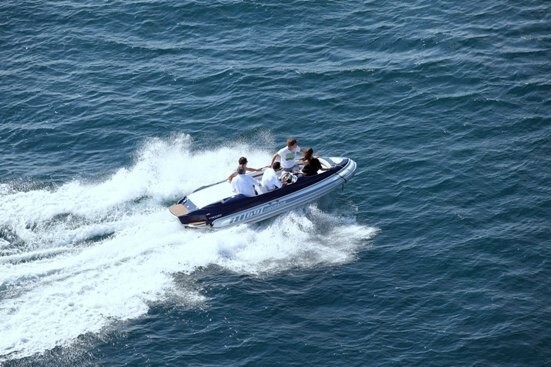 These include a 5 Metre tender, two stand-up jet skis, one three-seater jet bike, a banana, ringo, waterskis, wakeboard and snorkeling gear and fishing rods. 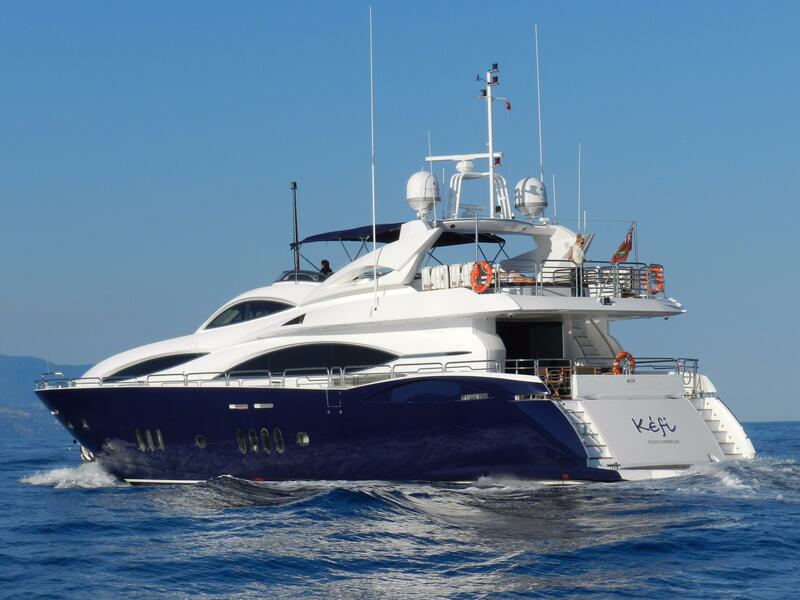 KEFI is equipped with twin MTU 2000 series main engines, capable of reaching a maximum speed of 26 knots and a sustained cruising speed of 20 knots, and a pair of Kohler 40 kilowatt generators. 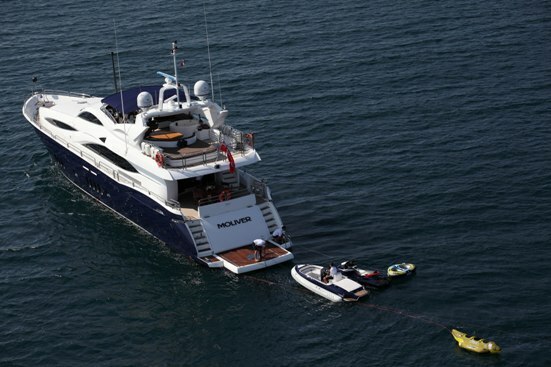 The yacht also boasts high-speed Wesmar stabilisers providing comfort and safety on board, effectively reducing rolling motion when underway. 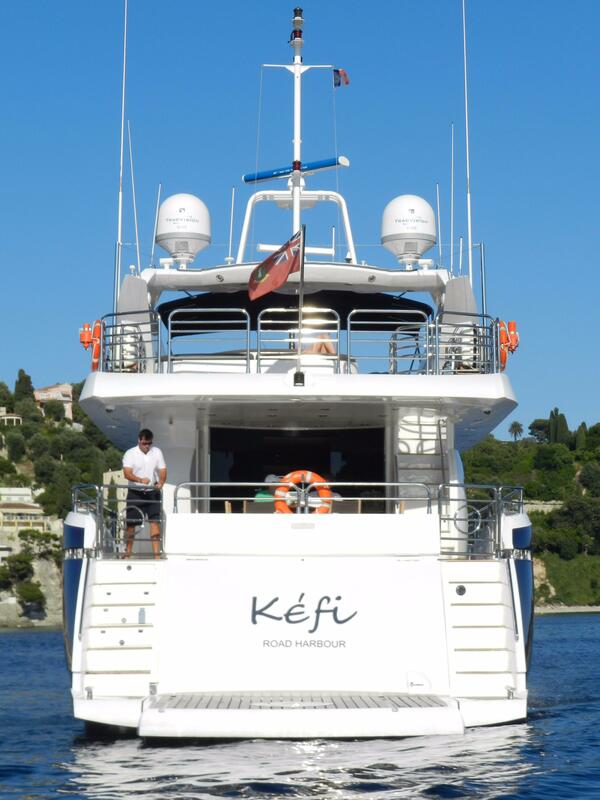 KEFI is able to accommodate up to 8 guests in 4 cabins. 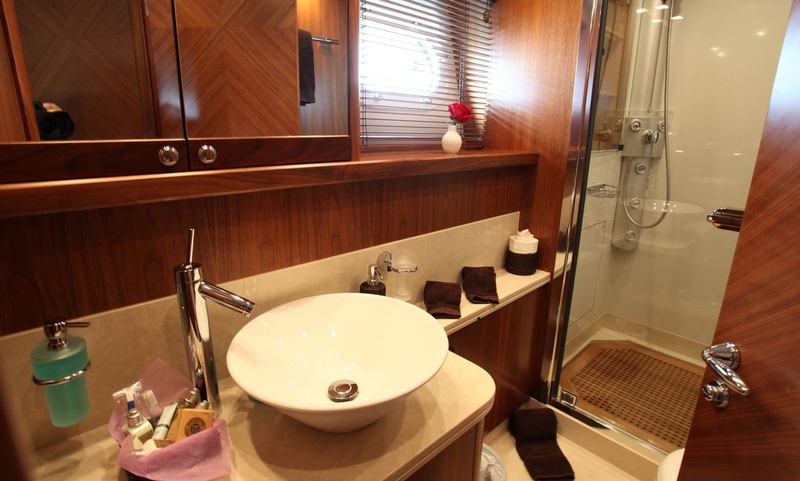 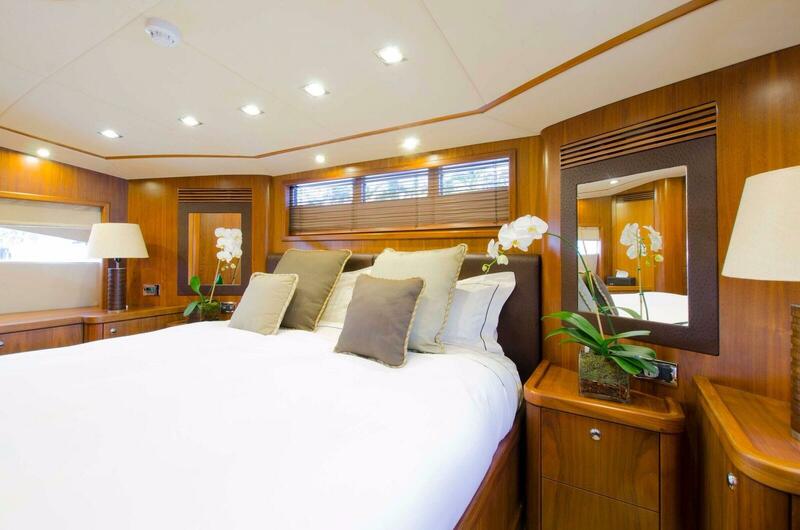 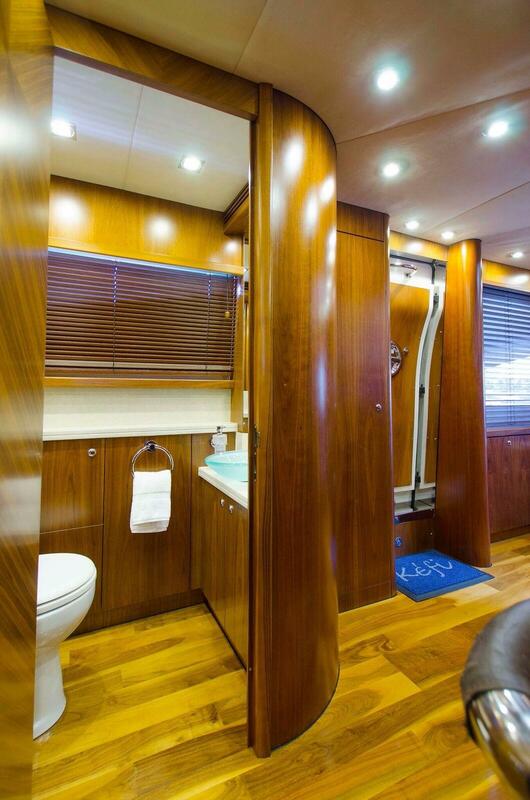 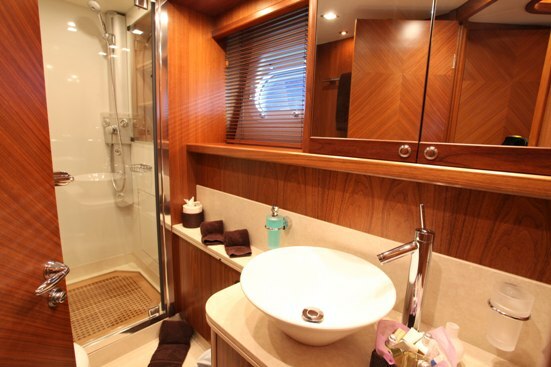 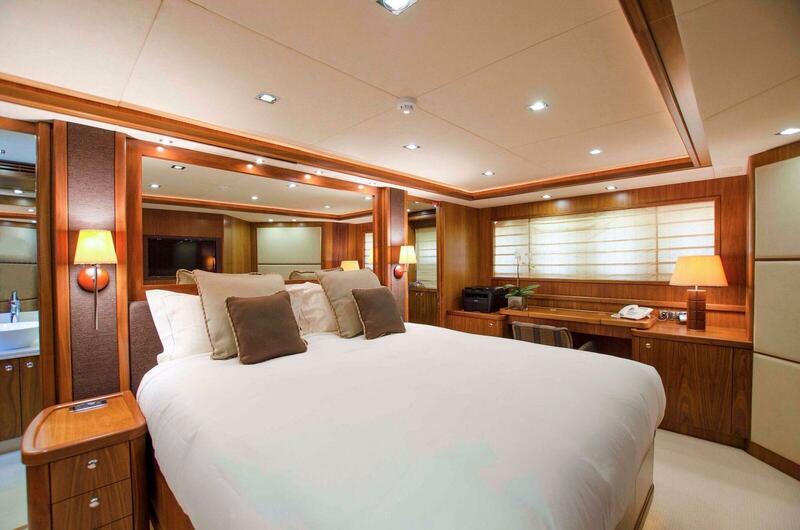 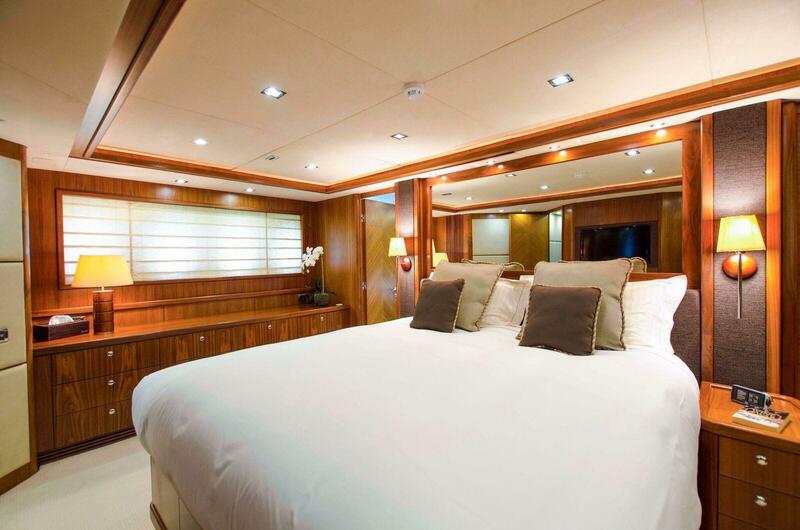 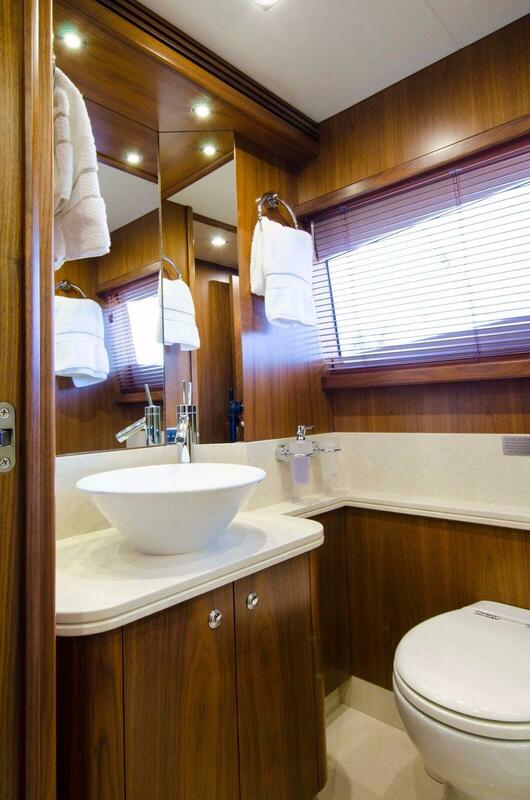 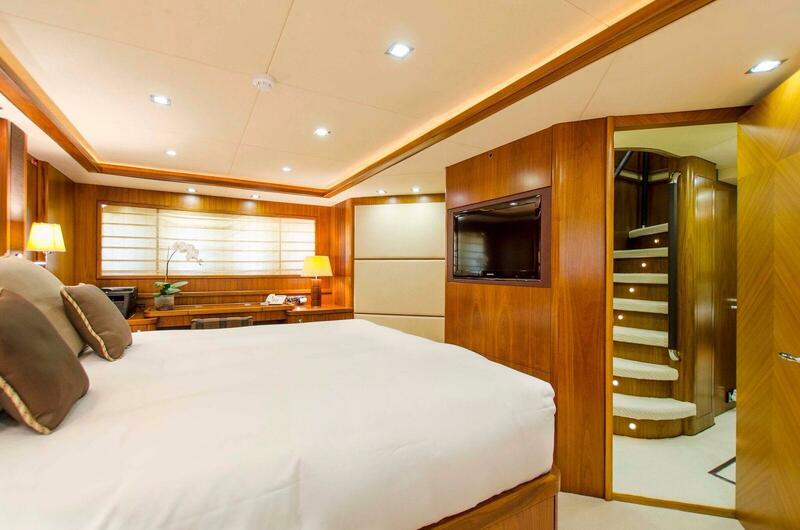 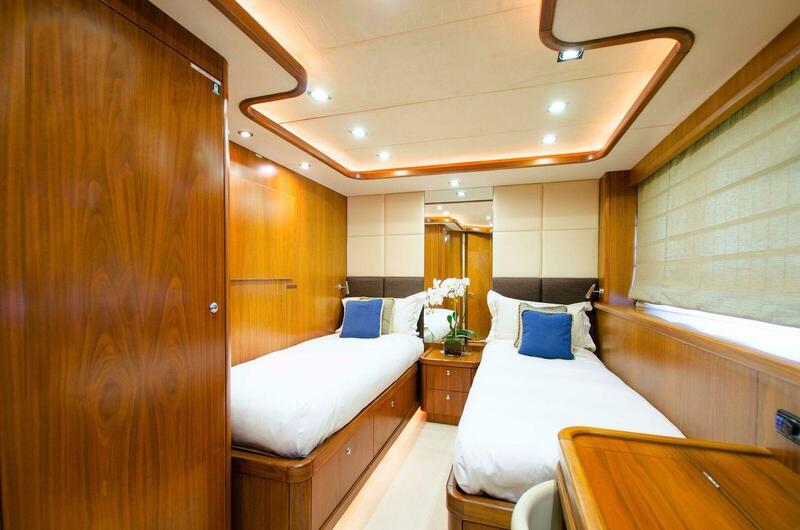 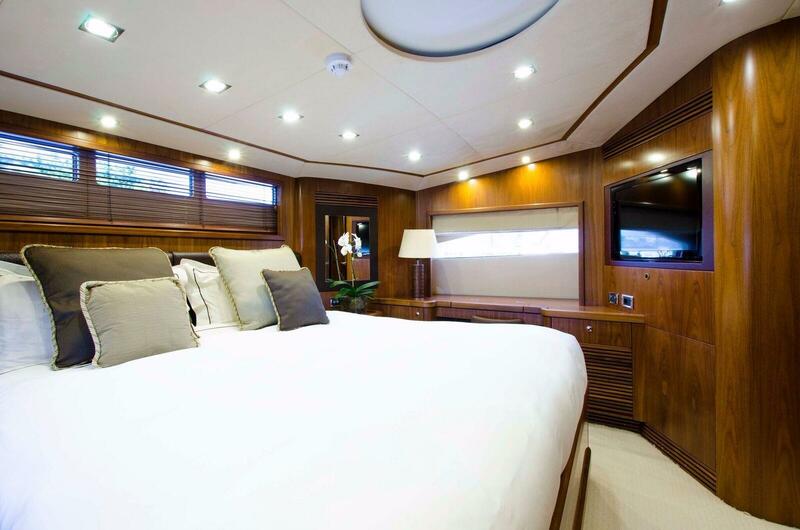 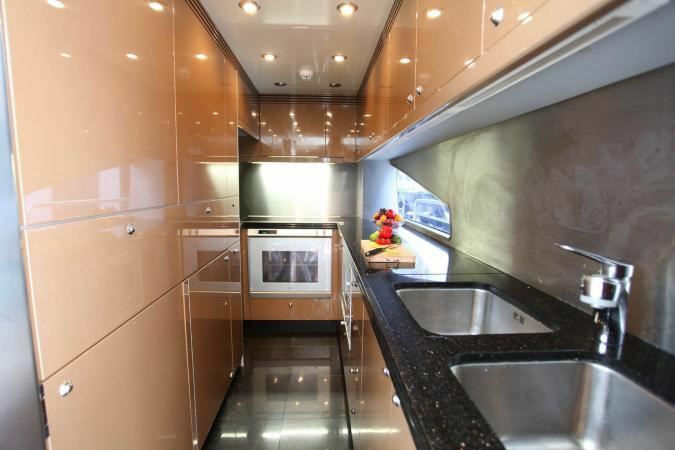 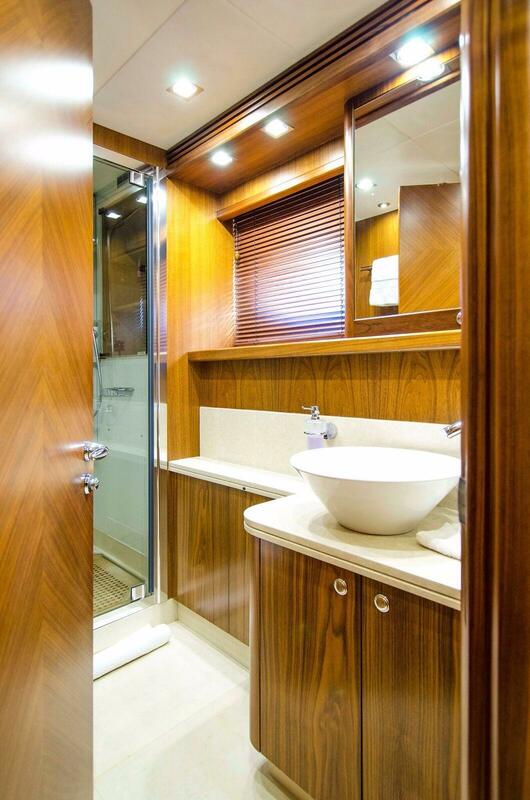 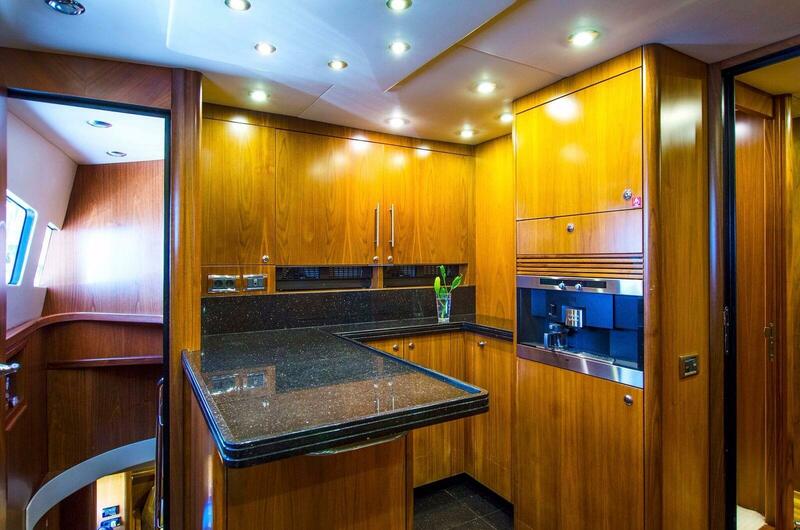 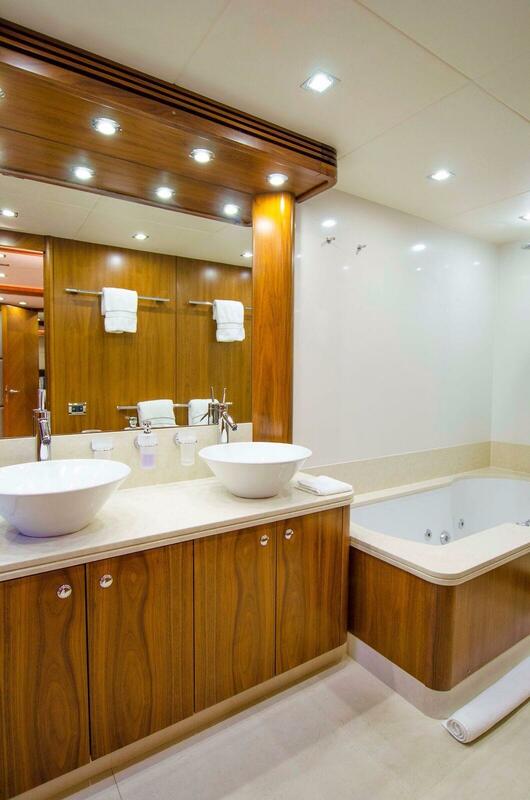 Her full width Master cabin is located aft and has a king sized bed, dressing table and settee, walk-in wardrobe and ensuite bathroom with double sinks and large shower. 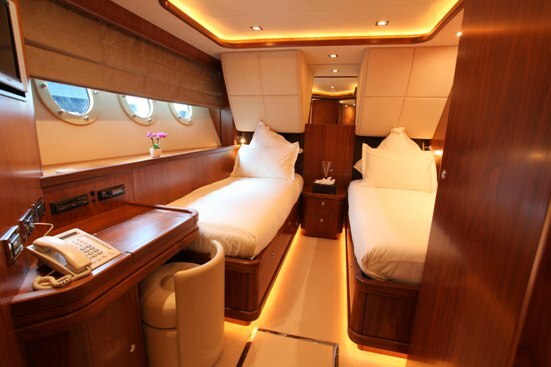 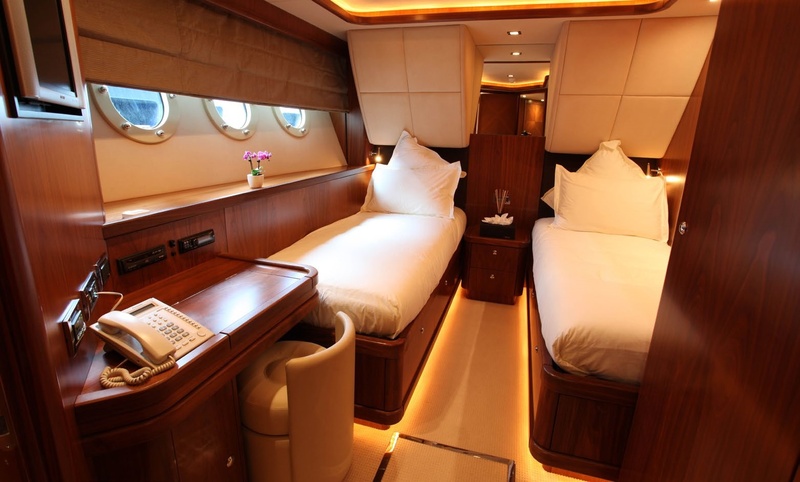 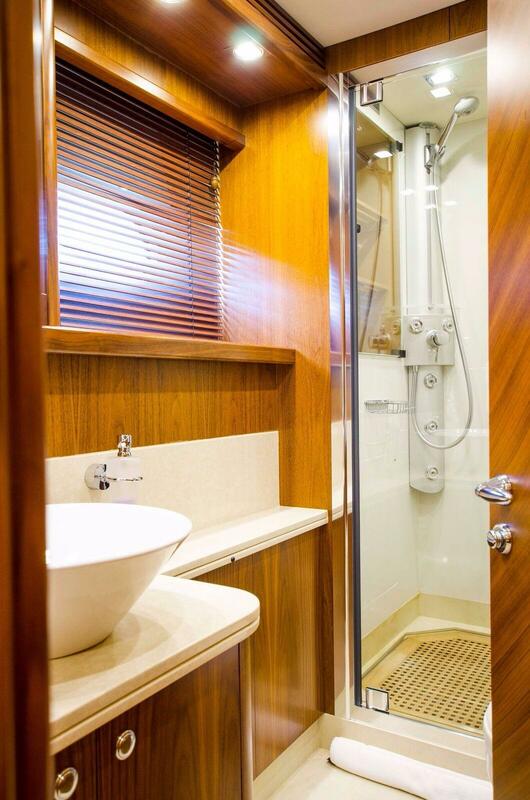 The VIP cabin is located forward with desk and en-suite bathroom with shower. 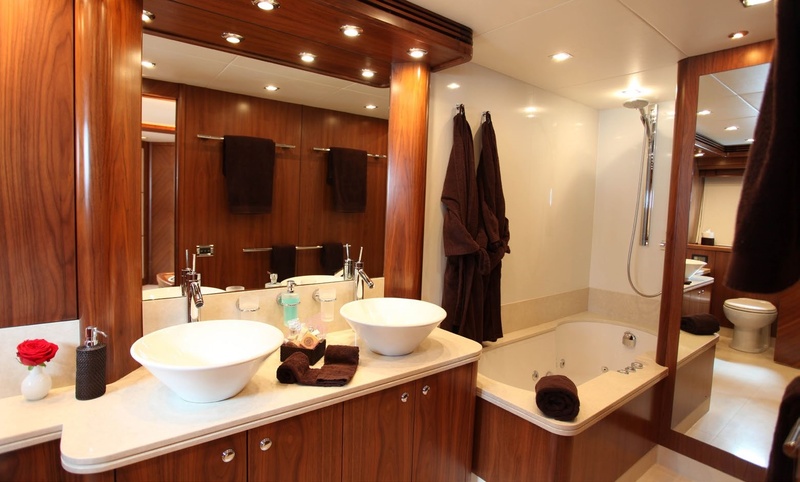 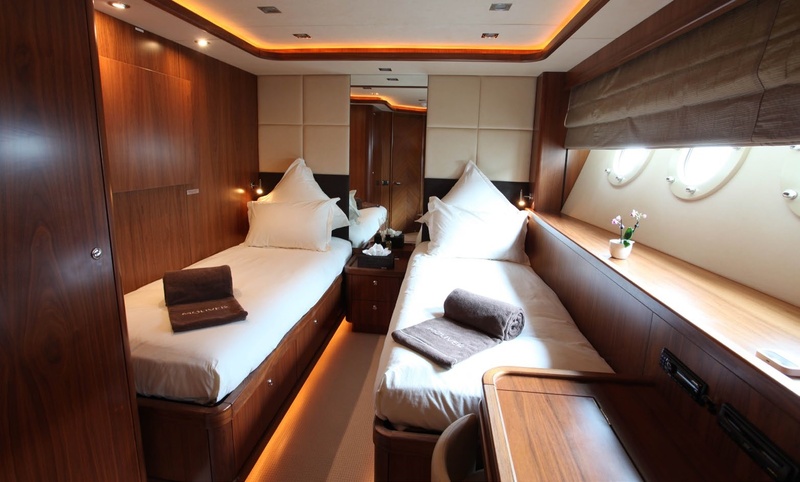 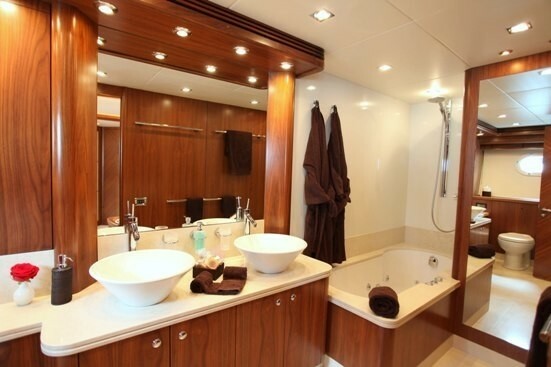 There are also two twin cabins, each with ensuite bathrooms. 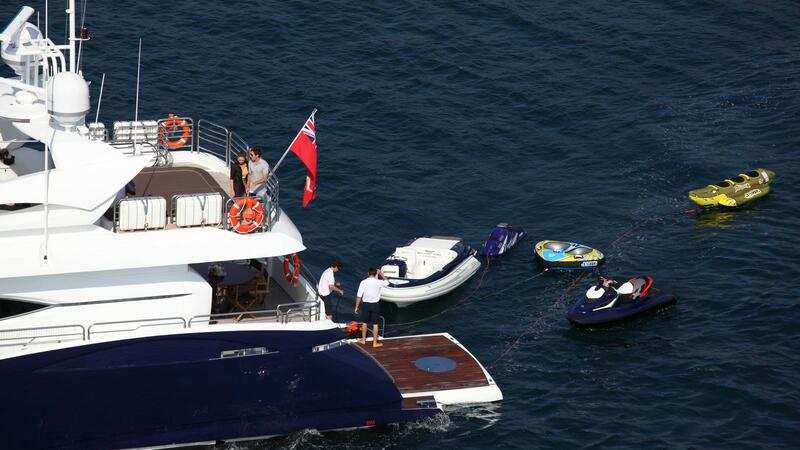 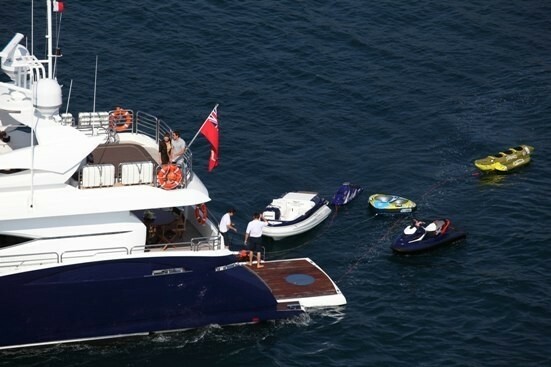 M/Y KEFI has an extensive range of extras onboard including the following Tenders & Toys: A 5m Novarania diesel 120HP, waverunner = Seadoo RXT-X-260 - 1500 HP 3 man capacity (new 2011), jetski 2 = Yamaha 700cc superjet standup (new 2011), banana, ringo, waterskis, akeboard,snorkeling gear. 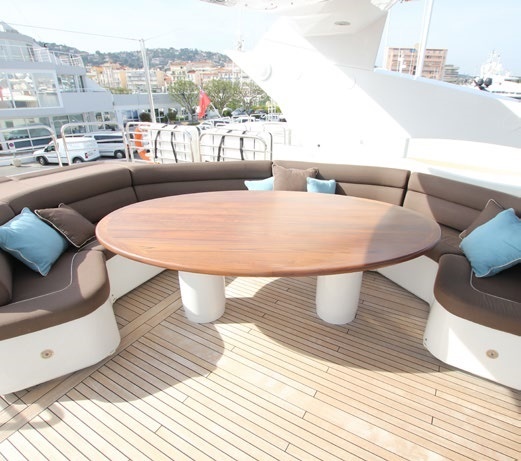 Communications include GSM Wifi, Audio Visual Equipment and Deck Facilities include Spa Pool, Satellite UK TV, IPOD Docking stations.